While the DeLorean Motor Company made one of the most beautiful cars of all time, with its DMC-12, the company itself was a bit more troubled. And for mentioning those troubles on air, ABC's new sitcom The Goldbergs has incurred the wrath of founder John DeLorean's daughter, Kathryn. First, a little background. While the DMC-12 was immortalized in Back to the Future, by the time that movie was on screens, the company that made it was all but dead. Troubled by less-than-stellar business practices, even worse sales, and an ongoing conflict in Northern Ireland where the cars were made, the DeLorean Motor Company was fighting against the tide just to start. The company wasn't doing so hot, to the point that Margaret Thatcher may have even wanted its famed founder dead. By 1982, its death was coming. In a desperate bid to find new investors, John DeLorean turned to a former-cocaine-smuggler-turned-FBI-informant. The FBI essentially set DeLorean up, and, fearing for his daughter's life after perceived threats, he went through with the negotiations with his new "investors." DeLorean was quickly arrested by the FBI for dealing cocaine, but he was acquitted because of the government's entrapment. "Aren't they out of business?" "It was all over the news, the owner, John DeLorean, he was arrested for trying to sell two FBI agents cocaine powder." Seems like pretty basic stuff in the world of sitcoms set in the 1980s that reference 1980s things. John DeLorean was arrested by the FBI for a cocaine deal. That much is fact. The show is set during the time between the arrest and the trial. So it doesn't seem like anything too crazy. So yeah, like I said, she's pissed. Though it sounds like she may be going a bit overboard with this. Yeah, he was arrested, but yeah, he was acquitted. We know that now. The characters in a sitcom set in 1982 do not know that. To have them all turn and face the camera and say "BUT SURELY IN THE FUTURE HE WILL BE ACQUITTED!" would be kind of weird. Also, she can just tell her kids Grandpa was entrapped by an evil FBI or something and he did nothing wrong, so I guess you could do that. It's not like they weren't going to learn about it eventually. Kathryn DeLorean should be proud that her father and his company are still seen as a relevant cultural reference. He built a great car, one that's still lusted over today. The saddest part about this whole thing, though, is probably something else. 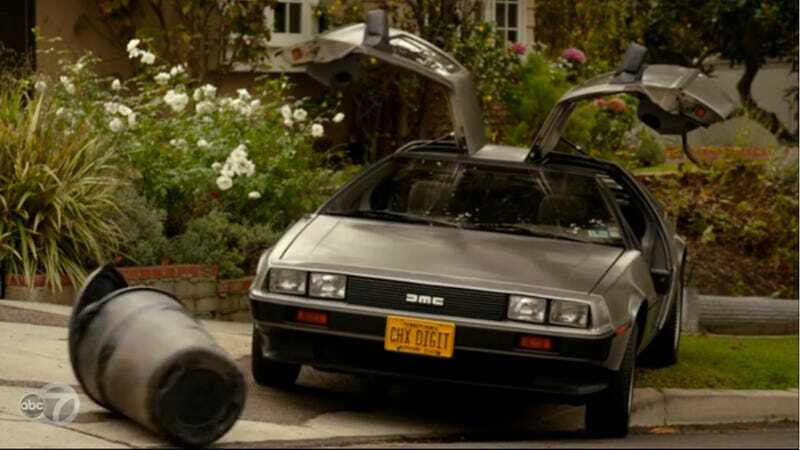 John DeLorean was referenced on The Goldbergs. I had to watch the whole goddamn episode for that quote. It was terrible. What lovely people you all are. First of all, I was not watching the Goldbergs, much to my dismay, my husband was watching the terrible show that I find mindless and utterly boring. So now that we have that out of the way. Second of all, the photo is not me, it is a zombie costume, of not me and that is as far as I will go with that one. I am a mother of three children, I am an information security analyst (professional geek) and I am an avid car lover. I also homeschool my two girls (let the s*** storm begin on that one), I am a Girl Scout leader and I am a damn good parent. The original post, which was deleted, was not an angry Kanye b****fest, it was short, to the point, and quite eloquent. Simply stating that I found the joke rude and uncalled for and I would have preferred if they had at least brought up that he had been acquitted. The show has consistently been historically all over the place per posts on their own facebook page. There is no reason it had to be set at the exact time when my father was in jail just to have a 30 second joke about it. I spent the better part of my life dealing with the aftermath of my father's arrest. I am not sure what all you people did with your yesterdays, but my childhood and early adulthood was filled with people asking me if my father was still in jail and making coke jokes (classy). I was made fun of most of my life because of my father. As a matter of fact, because of this story an old high school friend of mine apologized for the way he tormented me with a Nice and Smooth song when we were growing up. I did not choose to be born into a public life, nor do I have a lot of money or any sense of entitlement because of it. I worked my way up from a measly IT internship at a mortgage company to get where I am today, still making less than 6 figures, hanging out in the 99% and living a normal, everyday life, except for the fact that my father was an automotive genius. And while you are getting all up in arms about that last comment, I don't believe it is because of the Delorean, I believe it is because of over 200 patents that he created still being used on cars today, and the fact that he invented the modern day muscle car with the GTO. Back to homeschooling. We do not have network TV, nor do my children have cell phones or unfettered access to the internet. I am not overprotective, I expose my children to real life. They know about the birds and the bees. They know that cuss words are arbitrary words picked up by society as bad and they are allowed to hear them because we discuss what it means and WHY we shouldn't say them (once upon a time Gadzooks was a bigger cuss than the F word). But I didn't explain to them what happened with my father yet, because it wasn't an every day reality like it was when I was growing up. It was all but forgotten and while my 14 year old knew the story, my younger ones did not. I had no intentions of hiding the truth from them, ever, I just felt that I had the time to allow them not to live under that stigma. I acknowledged to my friends and family that my reaction would bring more attention and light to the issue and further the spread of this story than the terrible sitcom that has a small user base. You know what though, it was a painful experience, an awful one, that reopened and salted a wound that the DMC community has worked a decade to close for me, all in the name of a silly joke on a second rate TV show. So I have every right to complain all over their Facebook. I have every right to be angry, hurt and upset. This show highly promoted their recent episode with the Delorean, only to drag it and my father through the mud.